Norwegian’s Free at Sea promotion now lets you choose up to 5 fantastic, FREE offers!Book a Studio or Inside stateroom and choose 1 free offer or choose 2 free offers whenyou book an Oceanview, Balcony or Mini-Suite. 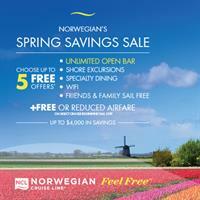 Best of all, cruise in Norwegian’s Concierge accommodations, a Suite or The Haven and enjoy all five free offers. Choose from a FREE beverage package, FREE shore excursion credits, FREE specialty dining, FREE WiFi and Friends & Family Sail FREE. Better yet, on select cruises beginning Fall 2019,Free or Reduced Airfare may also be an added perk.